Welcome to A1 Outdoor Storage in Deerfield Beach, Pompano Beach and now West Palm Beach! We proudly serve all of Broward and Palm Beach Counties including Boca Raton, Coconut Creek, Cooper City, Coral Springs, Dania Beach, Davie, Deerfield Beach, Fort Lauderdale, Hallandale Beach, Hillsboro Beach, Hollywood, Lauderdale-By-The-Sea, Lauderhill, Lauderdale Lakes, Lighthouse Point, Margate, Miramar, North Lauderdale, Oakland Park, Parkland, Pembroke Park, Pembroke Pines, Plantation, Pompano Beach, Sea Ranch Lakes, Southwest Ranches, Sunrise, Tamarac, Weston, West Palm Beach, West Park, Wilton Manors and all of South Florida. A1 Outdoor Storage offers gated, secure outdoor storage for boats, recreational vehicles (RVs), commercial vehicles, equipment and cars. Our 7 acre facility is secured with electronic gates, security cameras and a security guard on-site 24 hours a day. You can rest assured your toys are safe with us. All tenants have 24 hour access if desired- AT NO ADDITIONAL CHARGE. Our location in Deerfield Beach, Florida makes us a convenient outdoor storage facility since we are located just minutes from I-95, Sawgrass Expressway and the Turnpike. 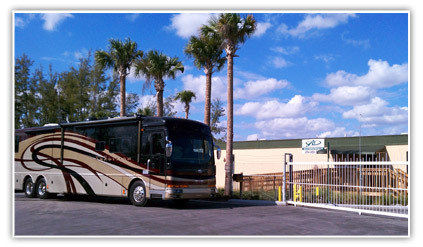 Our RV Storage and Boat Storage spaces are flexible with large drive isles for your ease and convenience. You'll enjoy our friendly service, clean and well-maintained facility, and month-to-month leases. We have two separate entrances to our site, one for recreational vehicles storage and the other for commercial vehicles storage. Recreational vehicle storage will be separated from commercial vehicle storage for convenience. Please contact us today for pricing and availability - our storage solutions are flexible to fit your unique needs. Our friendly associates look forward to hearing from you. Click on our "Current Specials" to view the unbelievable deals going on right now!! A1 Outdoor Storage is a subsidiary of A1 Body and Glass which has proudly been in business for 35 years.